Definition at line 24 of file Mips.h. Definition at line 59 of file Mips.h. Definition at line 63 of file Mips.h. Definition at line 266 of file Mips.h. Fill a SmallVectorImpl with the valid values to setCPU. Definition at line 56 of file Mips.cpp. Definition at line 96 of file Mips.h. Definition at line 197 of file Mips.h. Definition at line 280 of file Mips.h. Definition at line 174 of file Mips.h. Return the register number that __builtin_eh_return_regno would return with the specified argument. 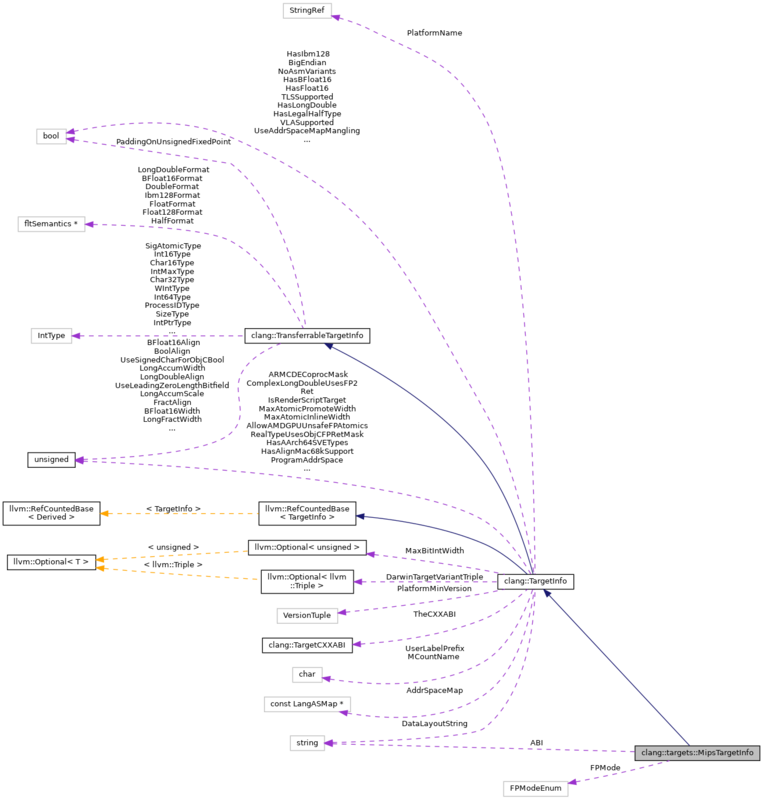 This corresponds with TargetLowering's getExceptionPointerRegister and getExceptionSelectorRegister in the backend. Definition at line 358 of file Mips.h. Definition at line 368 of file Mips.h. Definition at line 201 of file Mips.h. Definition at line 61 of file Mips.cpp. Return information about target-specific builtins for the current primary target, and info about which builtins are non-portable across the current set of primary and secondary targets. Definition at line 213 of file Mips.cpp. Definition at line 71 of file Mips.cpp. Definition at line 218 of file Mips.cpp. Perform initialization based on the user configured set of features (e.g., +sse4). The list is guaranteed to have at most one entry per feature. The target may modify the features list, to change which options are passed onwards to the backend. FIXME: This part should be fixed so that we can change handleTargetFeatures to merely a TargetInfo initialization routine. Definition at line 305 of file Mips.h. Determine whether the given target has the given feature. Definition at line 206 of file Mips.cpp. Determine whether the __int128 type is supported on this target. Definition at line 400 of file Mips.h. 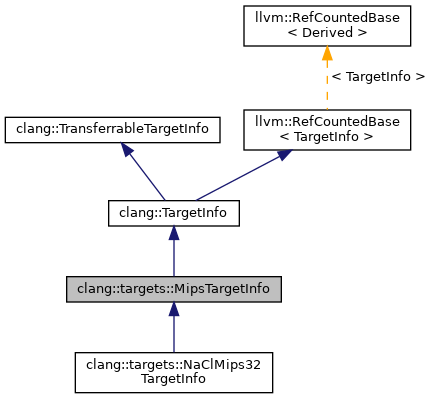 Initialize the map with the default set of target features for the CPU this should include all legal feature strings on the target. False on error (invalid features). Definition at line 176 of file Mips.h. The __builtin_clz* and __builtin_ctz* built-in functions are specified to have undefined results for zero inputs, but on targets that support these operations in a way that provides well-defined results for zero without loss of performance, it is a good idea to avoid optimizing based on that undef behavior. Definition at line 366 of file Mips.h. Definition at line 88 of file Mips.h. Definition at line 84 of file Mips.h. Returns true if NaN encoding is IEEE 754-2008. Only MIPS allows a different encoding. Definition at line 92 of file Mips.h. brief Determine whether this TargetInfo supports the given CPU name. Definition at line 52 of file Mips.cpp. Definition at line 31 of file Mips.cpp. False on error (invalid ABI name). Definition at line 98 of file Mips.h. False on error (invalid CPU name). Definition at line 169 of file Mips.h. Definition at line 156 of file Mips.h. Definition at line 131 of file Mips.h. Definition at line 142 of file Mips.h. Definition at line 118 of file Mips.h. Definition at line 230 of file Mips.h. Check the target is valid after it is fully initialized. Definition at line 226 of file Mips.cpp. References ABI, FP64, FPMode, FPXX, getISARev(), clang::TargetInfo::getTriple(), processorSupportsGPR64(), and clang::DiagnosticsEngine::Report(). Definition at line 60 of file Mips.h. Referenced by getUnwindWordWidth(), and validateTarget(). Referenced by hasFeature(), and validateTarget().